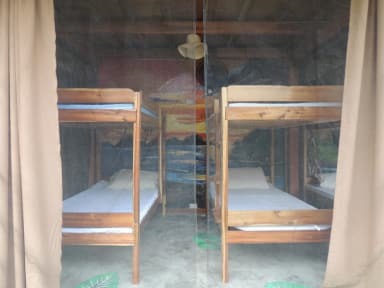 El Nido's newest and swinging-est backpackers' hostel! Clean and cheap and comfortable. Bunk beds and single beds available in shared open fan rooms. 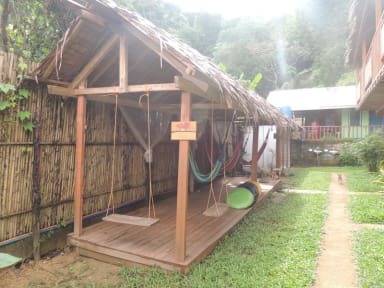 Come and chill with us in this peaceful hotel where you can relax in our hammocks and use our shared kitchen. We are very close to Las Cabanas beach ! Swinging carabao hostel is super chill! They instantly warmly greet you and show you the beds, with a complementary drink on arrival and towel was a nice touch! I was clumsy enough to split my head on the locker door. AJ was more then happy to help look after me! Can’t rate this hostel highly enough! Amazing staff! Very helpful and kind! It’s not a party hostel but it’s righr beside the outpost hostel so you’re walking distance to hang out there. Also very close to las cabanas beach and only a 50- 100 peso ride by tricycle to El Nido proper. Heated shower, comfy and quiet sleeping areas! Would definitely go back ! lovely hostel. very chilled out vibe.. hammocks, average sowers and toilets for the Philippines, lockers, food and drink available and a shop 30m down the road. Great staff, one guy even gave me a lift on his scooter into town when my bus to Port Barton failed to pick me up.. Honestly shouldn’t even get 3.4. There are no walls whatsoever but there’s a rooster next door that prevented all of us from sleeping. Before I checked in I cancelled my last night since I was leaving a day earlier. This was more than 3 days in advance (per their policy) and they were not helpful in any way. When I left to check out the next day, I went through the whole ordeal again trying to cancel the last day but still paid for the two nights I did not stay. Just don’t go, seriously. Only stay here if you want zero sleep all night. There are several cockerels crowing all night, the neighbours play music till 2am (this happen all the time we stayed there) and it’s on the main road so traffic noise is really loud too. There’s also the resistant dog the barks all night long non stop. Add in the drunks who roll in at all hours. Walls are made of hanging sheets so expect no privacy either. Overall terrible and beds are super uncomfortable worn out foam too. The place was extremely loud. Did not sleep at all. Left as soon as possible. Awful. Just awful. Never again. Wifi doesn't work. Good luck to anyone that stays there. We would not recommend this hostel because it was very far from the center of town, didn't have good wifi, wasn't indoors, and the showers didn't work. On top of all of that, it's the same price as better hostels that are closer to the city center. We ended up switching hostels and we were so glad we did because it's way overpriced for what you get.